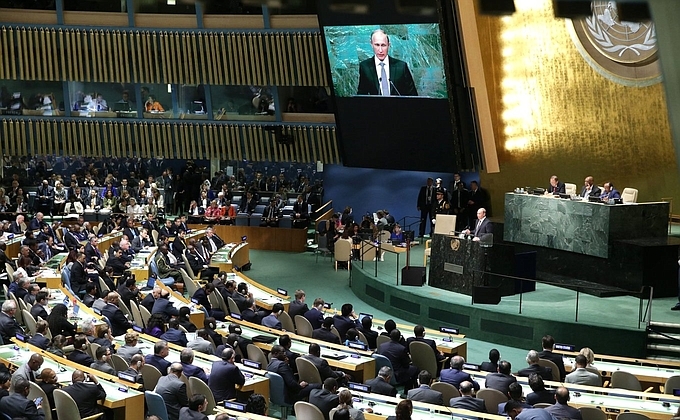 At the 70th anniversary session of the United Nations general Assembly in New York, Russian President Vladimir Putin reiterated and broadened Russia’s earlier proposal for the creation of an anti-jihadi coalition. If earlier the idea was limited to coordinating Russian military assistance with combat operations carried out by the Syrian and Iraqi armies, the Kurdish Peshmerga, and Iranian special forces, now Moscow is proposing a more broad international coalition modeled on the anti-Nazi coalition of World War Two. Specifically, Putin broached “a broad, international, anti-terrorist coalition,” which, “like the anti-Hitler coalition, could unite in its ranks very different forces prepared to decisively resist those who like the Nazis sew evil and hatred of mankind.” “(T)he key participants of such a coalition should be Muslim countries,” in Putin’s view (http://kremlin.ru/events/president/news/50385). Thus, the new proposal would add a series of other Muslim countries to the forces of the coalition as first proposed. Thus, in addition to those in Iraq and Syria fighting the Islamic State and other jihadi groups could be added Jordan, Egypt, and other Muslim countries that have expressed an interest in fighting the jihadists. What stands behind Putin’s demarche? Some rather unbalanced answers to this question have emerged. Some argue that Putin is solely interested in supplanting American power in the region. ‘Challenging American power in the region’ is much less important a factor in Russia’s intervention in Syria than most American specialists egocentrically think. Others – like neoconservative FOX News commentator K.T. McFarland, who served in national security posts in the Nixon, Ford and Reagan administrations, Anton Shekhovtsov of Russia’s Sova Center, and Sam Greene of London’s King’s College – claim that Putin is inserting Russian military force into the Syrian equation in order to increase the flow of refugees to Europe (https://www.facebook.com/photo.php?fbid=10153073100476516&set=a.10150208275601516.312509.750581515&type=3&theater and http://news.rambler.ru/world/31263242/?utm_source=adfox_site_36985&utm_medium=adfox_banner_1401793&utm_campaign=adfox_campaign_495794&ues=1). This claim or hypothesis is of little merit other than its being rather instructive as to the level of irrationality and paranoia towards Putin and Russia gripping much of American rusology (though Greene is a Brit, I believe). More sober analysis would suggest that no matter who might have come out against the Assad regime’s survival – America, Europe, the Saudis, Qataris, and/or other actors – Moscow would have been inclined to oppose such a move. The fact is that failed U.S. policies across the MENA (Middle East and North Africa) during the Barack Obama asministration have created a vacuum of power on the ground that created the crisis on the ground and in world leadership to resolve it. There are in fact fundamental geopolitical, domestic security, and historic-civilizational motivations behind Putin’s move in Syria than simply sparring with the U.S. over leadership roles in the region. This does not mean that Putin is not primarily interested in saving Assad, but it does mean that he has multiple motives. At the same time, it is unlikely that Putin would have intervened solely to save Assad and strengthen Russia’s hand in the Middle East. No doubt, Putin hopes to take advantage of that vacuum in Levant and the larger MENA to bolster Russia’s authority and power in the region and globally, but his proposal makes clear that he seeks cooperation with the U.S. and other players. To be sure, key also are Russia’s objective geopolitical interests as well more subjective strategic cultural factors formed by a long history of relations in the region and a shorter history of Western military and political actions taken against Russian allies and interests since the end of the Cold War from Yugoslavia to Serbia to Georgia to Ukraine. This post-Cold war record of what are – with the possible exception of the still unfinished Ukrainian crisis – losses for Moscow make it more imperative that Moscow protect its Syrian ally and the military, political and cultural ties to it that connect it with the larger Levant and Middle East. Specifically, the fall of an ally would be another disastrous blow to Russian power and prestige. It would mean the loss of years of investment in the Assad regime and its only, albeit rather small, naval base in the Mediterranean Sea. Moreover, Putin may be concerned that Tehran might move to supplant or subordinate Assad, as it has made him increasingly reliant on its proxy Shiite Lebanese and Iraqi militias and Hezbollah. Putin’s intervention in Syria is forcing powers with swagger in the region to deal with Russia and its interests rather than ignore them. Israeli Prime Minister Benjamin Netanyahu rushed to Moscow to express Tel Aviv’s concerns regarding any advantages that might accrue to Hezbollah or Iranian moves in the Golan Heights as a result of Russia’s intervention and any stabilization of the Assad regime and war front in the north. US President Obama has been forced to agree to meet Putin for the first time in over a year as a result at least in part of Putin’s Syrian gambit. The Washington rumor mill has it that Obama advisor Susan Rice is tasked with overseeing a recently formed committee of Syria experts in order to develop a formula for coexisting with Assad, and influential European policymakers and opinion makers are thinking increasingly along similar lines (www.businessinsider.com/why-european-leaders-are-lining-up-behind-assad-2015-9). Citing a “senior” Assad advisor, the French AFP reports that Moscow and Washington have already reached a ‘tacit deal’ on his at least temporary continuation in power pending a transition to a new regime (http://news.yahoo.com/tacit-deal-between-us-russia-end-syria-war-133934478.html). But a challenge larger than getting the Western powers on board is convincing secularist and/or Sunni powers like Jordan, Egypt, Saudi Arabia, and the UAE to join a coalition in which Shiite actors appear to have the inside track. In terms of domestic security, it is absolutely incumbent for Putin to combat the growing threat to Russia from the global jihadi revolutionary movement spread along a great arc stretching across southern Eurasia just below Russia’s southern borders from Syria in the west to Central and South Asia in the east. The global jihad poses a greater danger to Russia and its sphere of influence and interests in Eurasia than to the U.S. and other regions of the world, with the possible exception of Europe. Both of the global jihad’s leading organizations – Al Qa`ida and the Islamic State – have allies or affiliates in Russia’s North Caucasus which threaten to spread to other regions of Russia. The Islamic State (IS) has a direct affiliate in Russia’s North Caucasus. The so-called ‘Caucasus Vilaiyat of the Islamic State’ (CVIS) emerged this year when some 70-80 percent of Russia’s global jihadi-oriented local jihadi organization, the Caucasus Emirwte (CE), broke away and declared the Islamic loyalty oath or ‘bayat‘ to IS and its self-declared ‘caliph’ Abu Bakr al-Baghdadi. However, the CE has had indirect links to IS for much longer. In 2012 then CE amir ‘Abu Usman’ Doku Umarov dispatched a group of amirs to Syria to link up with the jihadists there. One of them, ‘Umar al-Shishani’ Tarkhan Batirashvili, broke with the main group that formed around these amirs, and joined IS. He rose up the ranks to become the amir of IS’s northern front, which carries out combat and terrorist operations in northern Iraq and Syria along the borders with Turkey and Iraqi Kurdistan. Batirashvili’s brother, Tamaz, is IS’s leading financial operative. Tarkhan has always expressed an intent to return to the Caucasus and continue jihad against Russia. Now, with the IS’s affiliate, the CVIS, there Batirashvili need not to return in order to orchestrate IS operations there. It can be expected that under the Batirashvilis’ influence, IS will devote some significant resources to building up the CVIS’s capacity. The remainder of the CE remains loyal to Al Qa`ida (AQ) and, for example, its ally in Syria, Jabhat al-Nusra (JN). Until several months ago the major unit of foreign mujahedin fighting in Syria, Jeish al Muhajirin wal-Ansar (JMA), was led by the CE’s envoy to Syria, Salahuddin al-Shishani. He and his deputy or ‘naib’ Abdul-karim al-Krymskii (a Crimean Tatar from Crimea) were expelled from the JMA and have their own organization, the Caucasus Emirate in Sham (Levant) or CES. North Caucasian mujahedin remain in the JMA and other groups aligned with JN. These groups at the moment actually pose together a greater threat to the Assad regime than does IS. They carry out operations with other jihadi groups in and around Aleppo, Iblid, and even near Damascus. They also carry out operations near Latakia, not far from which sits the Russian naval base and the small though growing contingent of Russian marines and military equipment now being sent to bolster Assad. 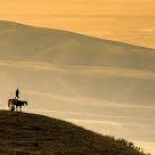 With hundreds of IS and other jihadi fighters returning to the Caucasus from Syria and Iraq, Putin and Russia’s security services would be self-destructively negligent if they did not pursue ways to counter this threat. Much like George W. Bush’s thinking during his presidency postulated it would be better to fight the jihadists before they came to the homeland, Putin’s intervention in Syria might draw more mujahedin away from the North Caucasus south to Syria to carry out jihad and be destroyed by Russian forces before they ever return home. Moreover, Putin can carry out the war against Caucasus mujahedin not alone but with Syrian, Iraqi, Iranian, Kurdish, and even Western partners. Another important consideration is that IS and AQ pose a growing threat to Russia’s neighbors in the former USSR, specially Azerbaijan and the Central Asian states. IS is already devoting considerable propaganda resources targeting Eurasia with the publication of two Russian-language journals targeting the region, as I detailed in a recent article on this site. Historico-civilizationally, the Russian Orthodox Church and Russian state have had deep ties with Eastern Orthodox Church communities throughout the Levant (especially Syria, Lebanon and Israel) for centuries. In the 17th century Russia forced the Ottoman Turks to recognize Russia’s right as the protector of Orthodox Christians across the Ottoman empire. In the 18th and 19th centuries this role shaped Russian foreign policy towards both the Porte and its sometimes Western allies. The Crimean War saw Russia come into conflict with Britain, France and the Ottoman Empire over the Russo-French dispute over which power would be official patron and protector of the Ottoman Empire’s Christians. During this real first world war, British ships sailed as far north as the Solovetsk Islands near the Arctic Circle and bombed the famous monastery there. Protection of Serbian and other Slavic Orthodox Christians from the Ottoman and Austro-Hungarian Empires drew Russia fatefully into World War I. Bitter religious warfare and memories of Islamic persecution are one of the forces that hold Orthodox Christians in the Balkans, Russia and the Middle East together. The long Islamic conquest of the Orthodox world, the destruction of Orthodox empires and kingdoms and the subjugation of Orthodox Christians to alien Islamic rule remains a vibrant memory. It connects the Serbs, the Greeks, the Greek Cypriots, the Russians, Bulgarians and many others — and Czarist Russia’s role in breaking Islamic rule and restoring freedom to Christian communities in the Balkans is remembered. Linked to that memory are memories of Western Christian treachery and betrayal. From the Fourth Crusade, ostensibly sent to protect Eastern Christians but turned into a piratical assault on Constantinople, to memories of how the westerners made their help conditional on Orthodox submission to the authority of the Popes, a history of betrayal shapes the Orthodox political mind in many of these countries. Today’s western support for “democracies” in the Middle East that turn into Islamist states fits into this historical pattern in the view of many people in the Orthodox world. From Serbia and Moscow, the dangers seem much more immediate than the dilettantes in Washington understand. Turkey’s ‘neo-Ottoman’ return to Islamist policies, Islamism rising across the Arab world, short sighted Western policies that stigmatize and oppress Orthodox resisters against the Islamic surge (Serbs in Bosnia and Kosovo, Russians in Afghanistan, Chechnya and Dagestan), or that stab eastern Christians in the back (‘unfair’ EU austerity in Greece, support for Islamists in Egypt and Syria, the destruction of the ancient Christian community in Iraq following the US invasion): all these revive memories and trigger reflexes that were already old in 1800 (http://blogs.the-american-interest.com/2012/06/03/what-russia-doesnt-forget/). Broken during the Soviet era, ties to the Christian levant have been renewed in the post-Soviet era, and the Imperial Orthodox Palestinian Society was revived. The IOPS was founded in 1882 as a result of a pilgrimage by members of the Romanov imperial family in response to the death of the Empress Maria Aleksandrovna in May 1880 and the murder of Tsar Aleexander II by socialist terrorists in March 1881. Those Orthodox communities are at risk of a genocide at the hands of IS and AQ. Christian Orthodox towns in Syria have been depopulated by mass exodus and destroyed by jihadi forces. In April 2013 priest, Metropolitan Pavel of Aleppo was kidnapped and killed by mujahedin near the Turkish border. Metropolitan was the brother of the Syrian Patriarch of Antioch Joann X himself, who has close ties with the Moscow Patriarchy of the Russian Orthodox Church. Other Eastern Orthodox priests have been beheaded in Syria by mujahedin from Russia’s North Caucasus. Therefore, rather than being some grand conspiracy to build a Russian empire and defeat the West in the ostensible ‘new cold war,’ Putin’s actions are actually about defending Russian positions in the region and national security at home. Any failure to realize the latter, real motivations behind Putin’s actions and instead favor of a focus on the former, imagined ones is fraught with specter of more gains for the jihadists and the greater likelihood of a world needlessly split apart on this and other key issues. To be sure, Putin’s demarche also fits into his larger projects of making Russia central Eurasia’s superpower, a global power to be reckoned with beyond Eurasia, and a bridge between the Western, Eurasian, Confucian, and Islamic civilizations. But this is not cold war. By seeking an anti-jihadi coalition that includes the West and Asia, Putin is pursuing both his primary goal of securing Russian national interests and security and his larger strategy of delimiting if not overcoming the Western-Eurasian civilizational rift and forging a broad Western-Eurasian-Confucian-Islamic multipolar world in which a future great Eurasian economic hub — at the center of which stands Russia — will play a central role.